Balka Strand. Charming cottage for 6 on undisturbed, grassy nature site at the most child-friendly sandy beach on Bornholm, Balka Strand. Dueodde. Nice 81 m² holiday house for 7 persons on a 2.500 m² natur property, 500 m from nice sandy beach. 3+1 bedrooms. Wireless internet. Bed linen and towels are not included! Øster Sømarken. Cosy 75m2 big half-timbering house with modern comfort for 4 persons. 200m to sand bathing beach. 10% discount on the rental at 2 weeks lease incl. consumption, free day of arrival. Pets not allowed. Svaneke - Listed. Holiday house for rent - a perle with a wonderful location direct to the sea, approx. 70 m² for 2 persons. With a wind protected patio, central heating and wash machine. Pedersker. Nice house having the terrace towards south and only 800 m to sandy bathing beach. TV at DR and satelite. Pets not allowed. Vang. High quality and tasteful holiday home for 4-5 persons with picturesque view to the Baltic Sea and the ruin of the castle Hammershus. Close to rocky coast in a beautiful protected area of northern Bornholm. SAT-TV. Fireplace. Internet. Almindingen. Idyllic house of a forest guard for 6 persons. Wonderful for nature lovers, in a class by itself, all seasons. Large undisturbed site in a protected wood area. Bath with lions claw, sauna, Turkish bath, woodburner, internet etc. Almindingen. Vallingebjerghus is a charming renovated forest guard house from the 1835th. The house is located in Almindingen surrounded by fields and woods, plot is 3000 m2 + the whole forest. Gudhjem. Welcome to Åhave, Salene Bay by Gudhjem. We rent Havhytten overlooking the Baltic and Christiansø - max.4 people - from DKK 2000 per week for two people. Rønne. Small romantic house in Rønne old town. The house has lounge, kitchen, shower, toilet, sleeps 4. 2. floor consists of a small room. A dollhouse with undisturbed courtyard. Near the harbor, lovely beach and very close to the center. Gudhjem. The Farm Hut - Åhave - Salene Bay - Gudhjem - Bornholm. 90 m2 for max. 6 persons. Living room with wood stove, open kitchen with dining area, bathroom, 3 bedrooms. 2 terraces and partial sea view. We also rent the Sea Hut. Øster Sømarken. Lovely 94-m2 holiday home for 6 people - 200m to fine sandy beach. Large dining and living room, 3 spacious bedrooms, new kitchen and bathroom with floor heating from 2012. The high comfort of the house makes it suitable for holidays all year round. Øster Sømarken. Lovely, well designed and inviting holiday house on natural plot in Øster Sømarken on the south coast of Bornholm close to fine sandy beach. Large family kitchen and 3 bedrooms, large terrace with swing and sand pit. Balka Strand. Lovely, small cottage for 4 people with 2 sun terraces. Charming lounge, 2 bedrooms and bathroom. The house is located on a quiet, undisturbed grassy site at the end of a closed road. Pets by agreement. Dueodde. 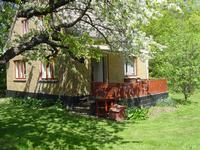 Cottage for 6 persons very nice located in Dueodde on a large natur property 600 m from the sea. 3 bedrooms. Gudhjem - Rø. House with two floors, terrace and garden. Scenic area, golf course, Helligdomsklipperne, museum. Close to public transportation. Ground floor: kitchen, bath, dining and living room and a single bedroom. 1 floor: 2 bedrooms with double beds. Gudhjem - Rø. Light flat in Rø at Gudhjem of 75 m2, 4-6 people. 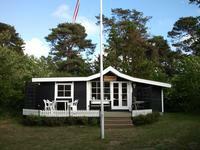 Located in wonderful nature in the North at the Helligdomsklipperne and golf courses. Lounge with wood stove, 2 bedrooms and kitchen. Access to garden.